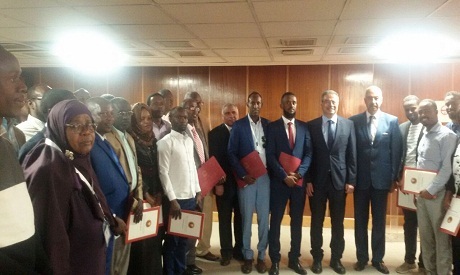 A ceremony was held on Thursday to mark the end of three training programmes on renewable energy and electricity for trainees from Nile Basin countries, a press statement from the Ministry of Electricity and Renewable Energy read. The 38 participants in the three training programmes came from Burundi, Djibouti, Ethiopia, Sudan, South Sudan, Somalia and Uganda. The programmes were on the SCADA electricity distribution system, wind energy technologies and energy efficiency, and contracts for infrastructure projects. Gaber Desouky, the head of the Egyptian Electricity Holding Company, said during the ceremony that the training programmes are part of the sector’s cooperation project with African countries, and the programmes and the sending of Egyptian experts to Nile Basin states are aimed at capacity building in those countries. The ministry started a series of training programmes designed for participants from Nile Basin countries in 2007, Desouky said.